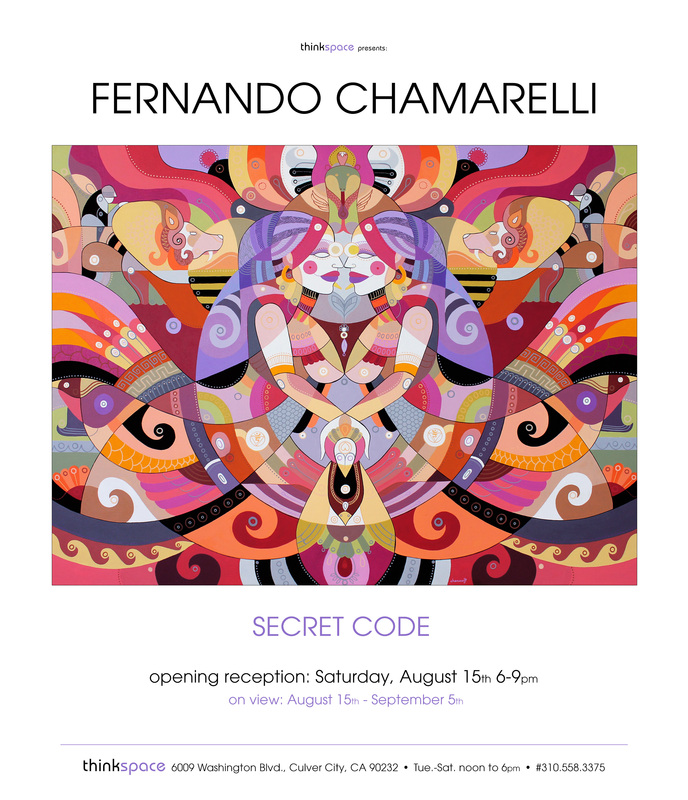 Thinkspace (Los Angeles) – is pleased to present new works by Brazilian designer, illustrator and artist Fernando Chamarelli in Secret Code, the artist’s second solo exhibition with the gallery. Chamarelli combines diverse graphic and cultural references to produce stunningly dense acrylic paintings. His distinctive use of line work and color reflect an eclectic graphic sensibility informed by everything from design, tattoos, street art and ancient history. Schooled in graphic design, Chamarelli creates complex mosaic like surfaces, filled with hybrid imagery and symbolism he has drawn from the varied aggregate of aesthetics, visual cultures and philosophies that inspire him. Recurring references in his works include Brazilian culture and music, astrology, occultism, and ancient pre-Columbian cultures. He creates an immersive and storied visual world that with each revisitation offers a new discovery. By merging contemporary influences with ancient and historical elements, Chamarelli creates a visual language that suspends past and present. Inspired by his Brazilian heritage, Chamarelli channels the disparateness of his cultural environment through his work, tapping into his country’s rich history of contrasts and coexisting diversities. He incorporates elements of Brazilian folklore, carnival, indigenous costume and myth, while borrowing imagery from Aztec, Incan and Mayan histories, among others. Fascinated by sacred geometries and the symbology of ancient cultures, Chamarelli builds beautifully anomalous and surreal iconographies with hidden meanings and intersecting significations. By drawing from different philosophies, and seemingly divergent aesthetics, he creates something entirely transformed from the appropriated parts of existing traditions. 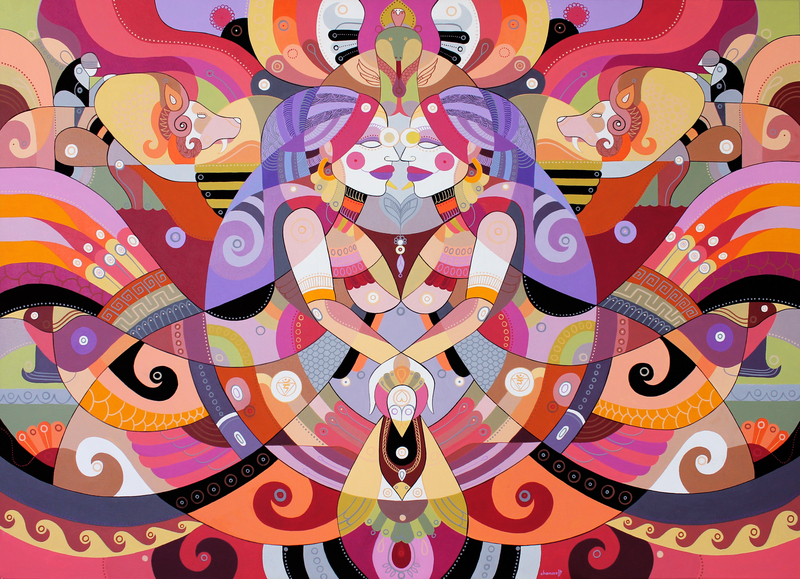 Chamarelli’s works are filled with mystical creatures, organic flora, totemic animals and geometric motifs, knit together in dense interconnected compositions that are brought to life with vibrantly psychedelic color palettes. These compositions are thick with visual information, line, shapes, geometries and figures. Their individual parts, however, are completely absorbed and integrated into the whole of an indivisible design. Incredibly stylized and optically intricate, the work at first reads as seamless overall pattern until, upon closer inspection, the elements are disentangled and individuated by the viewer. Chamarelli successfully unites several stories and traditions into a single image, encouraging a multiplicity of tangential readings and discoveries. As the exhibition title, Secret Code, suggests, Chamarelli’s works present hidden narratives and mysteriously adapted iconographies. Like intricately constructed tessellations, each minute element in each composition is an integral piece of a larger puzzle. The cryptic symbolism of these works feels somehow infinite and universal; simultaneously contemporary and ancient, historical and yet entirely new. Chamarelli offers us a dense and evasive world of appropriated histories, and inventive new ones, all held together by the harmony of beautifully continuous and uninterrupted lines.